Keeping more of your trading profits is one thing we can all rally around. The challenge we all will face is when we review our prior trades and see that the move went well beyond our initial target. This fear of missing out, "FOMO," leads to future overestimation of profit potential. If you are not careful, this cycle of applying realistic targets and taking money out of the market is broken as you seek more profits on every trade. 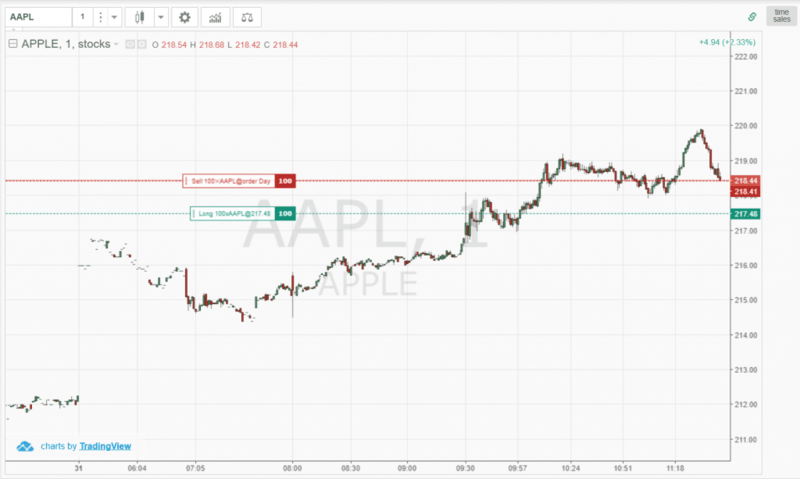 This is where a trailing stop loss can prove itself a valuable tool to assist you in keeping more profits in your pocket. 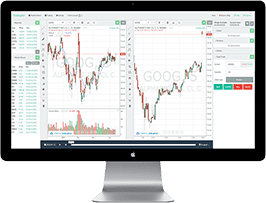 In this article, we will walk through step-by-step how to use trailing stops and how you include this money management technique in your trading system. 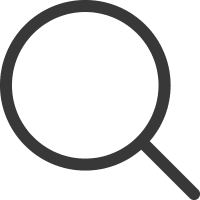 Do Trailing Stop Losses Adjust Downward? 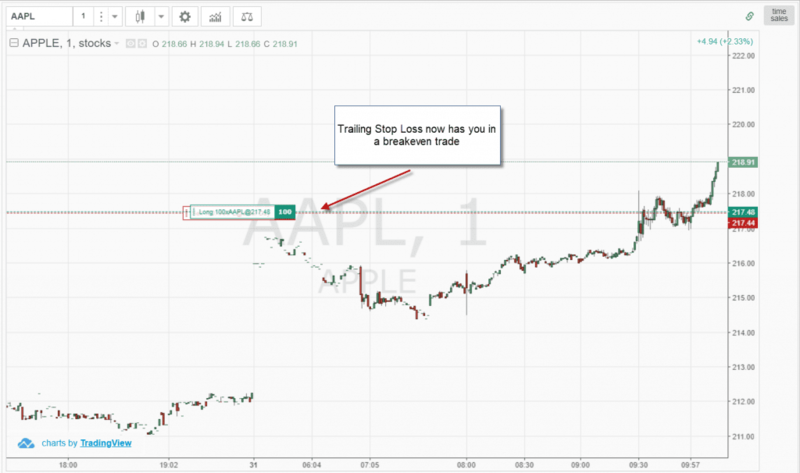 A trailing stop-loss order is one that follows your trade as it goes in your favor. This order type can be applied for both long and short trades. Therefore, if you are long and the stock moves higher, your order for exiting the trade moves up as well. Conversely, if you are short, your stop will move lower as the stock drops. To activate a trailing stop, you will first need to enter a trade. You can do this by either going long or short. In the first example, we will take a long position in Apple. Now that you are in a long position, you will need to enter your trailing stop loss order. In my trading, I use the pre-market to identify all of my buy and sell order levels. Doing this in the pre-market allows me to stay objective and not get emotional as the price action is flowing right before my eyes. 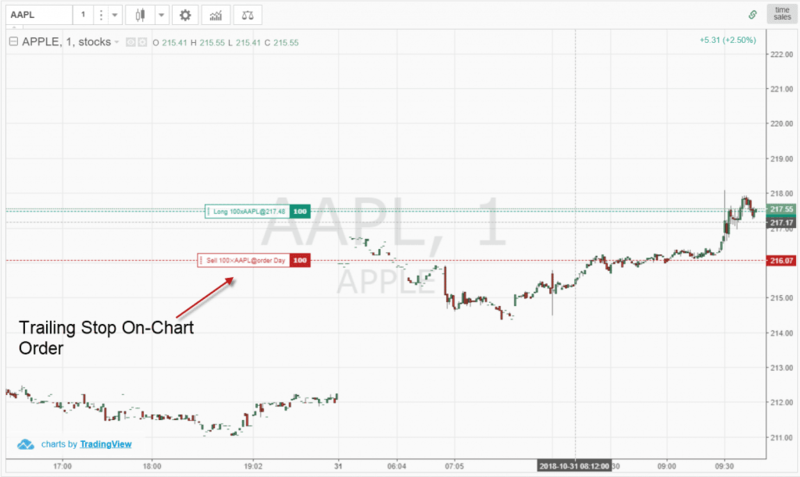 Shifting back to the Apple chart, where do you think is the logical area to place a trailing stop loss? Your first inclination may be to go for the swing low point back at $216.97. But remember, this is a trailing stop which follows the move as it goes in your favor. 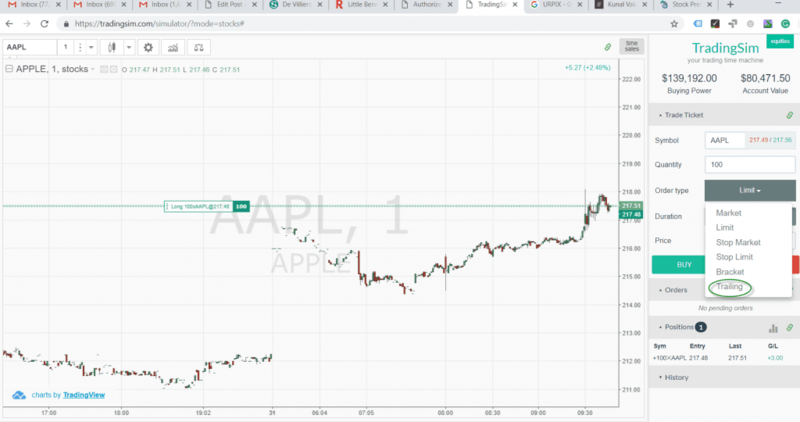 So, it's more about looking at recent price swings to get a feel for how far Apple can pull back but still keep the trend intact. It's probably a little hard to see, so click the image to zoom in, but the retracements on the way down were less than $1.50. Since the volatility is somewhat predictable. Let's see if applying the $1.50 stop loss will allow us to ride the trend higher. Next, we will enter the $1.50 in the amount for the trail. Remember, the trail is a sell order since we are long the stock. Once the trail is set, you let the stock do its thing and stay out of the way. 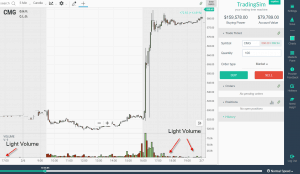 When reviewing your chart, you will notice a new sell order that moves with your stock as it goes in your favor. 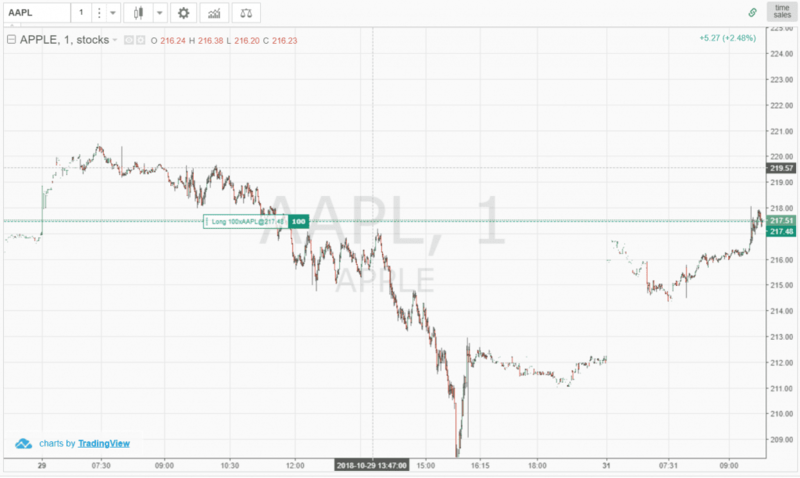 Notice as Apple moves higher, the trailing stop loss has moved in your favor. 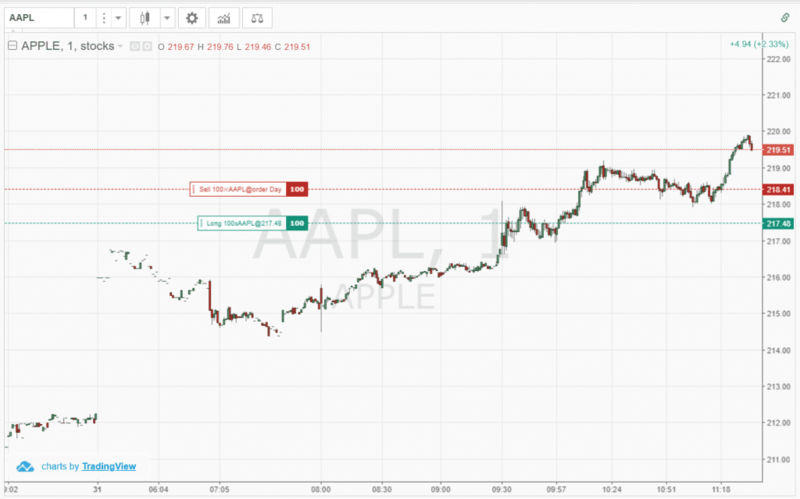 As Apple pulls back from its most recent high, the trailing stop loss holds its ground. The stop loss will only move as the action goes in your favor. This process of the stop moving higher continues for as long as you have the position open. Look at the image above as the stop has now moved above the original trade entry. At this point you are in a profitable trade and things can only go further in your favor. This last snapshot was taken right before the price was closed out with the trailing stop. Do you see how price moves in your favor with every wave higher? Is this something you could apply to your day trading and swing trading activities? 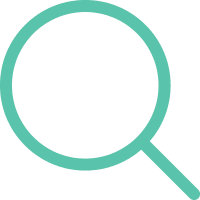 Let's continue on, to see if we have a fit for your trading style. Next, we will discuss the same process but on the short side. First, we need to identify a stock with a strong downtrend to enter a short position. At the current time, there are some jitters in the markets related to pending trade agreements. 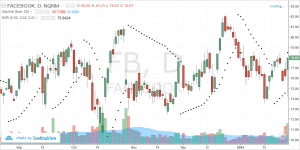 In this example, we will highlight the stock Spotify which has been negatively impacted by negative sentiment in the broad market. 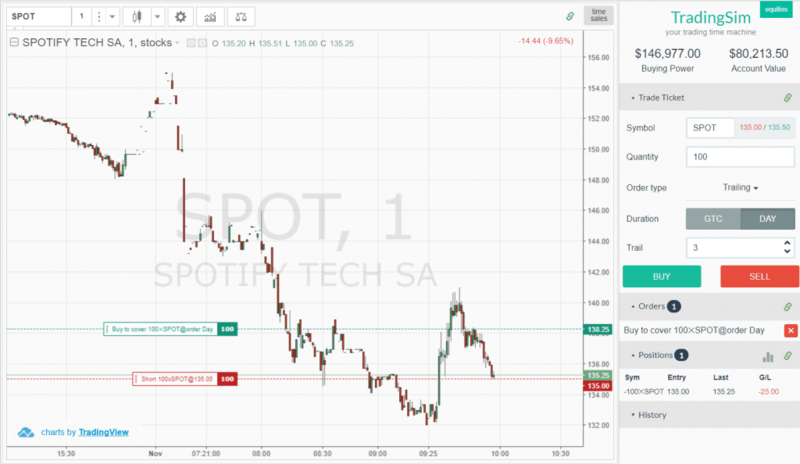 We place a short entry right on the open and based on recent price activity, use a trailing stop loss of 3$. Notice how this is simply the inverse of the long Apple example we reviewed earlier in this post. 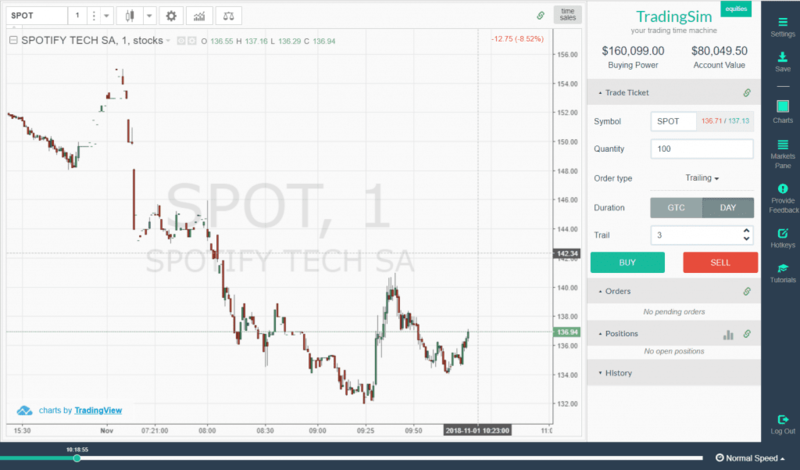 In this example, the stock barely moves in your favor before the trailing stop loss is triggered. At this point, we are stopped out of the position for a loss and you know what? That is just fine. It's not always about every trade turning a profit. 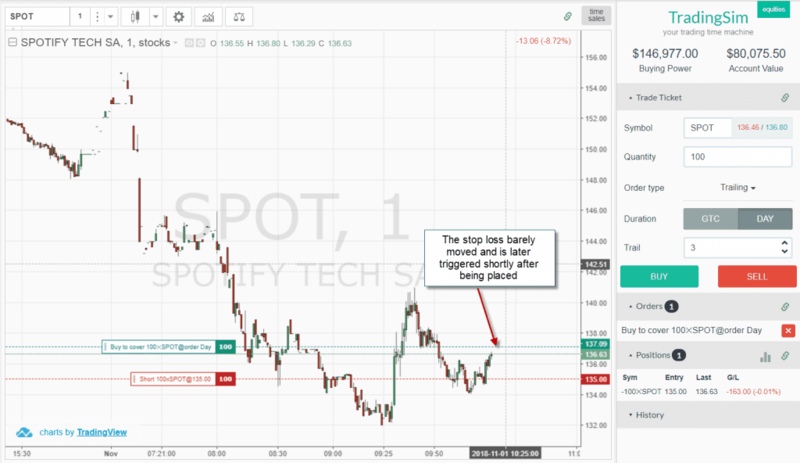 In the prior examples for both long and short setups, we placed a trailing stop loss order the moment we entered the trade. This method of immediately placing the order builds the discipline to always focus on making money. You can first set a max stop loss order and keep this active until your first profit target is reached. At this point, you can activate a trailing stop once you have secured a decent profit on the trade. This method is reserved for those of you that have mastered the greed which will seep into your trading decisions. The risk here is that your eyes will get big and you will see more in the trade than is possible. Conversely, if greed doesn't get you, the next emotion which can kick-in is fear. 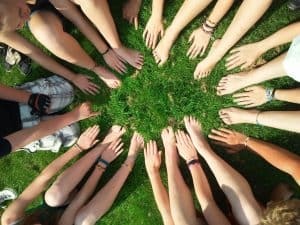 You have already cleared the hurdle of opening the position, now the fear of giving back the profits you have so rightfully earned will start to pop in your head. Therefore, you run the risk of never actually entering the trailing stop and just exiting the position too soon. These are all things you will need to consider if you elect to not enter a trailing stop once you open your position. One could argue why have an entire section designated to this topic. Believe it or not, many new traders ask this question. So, let me be as clear as possible, trailing stops do not adjust downward. Downward meaning they move against you to increase your potential for losses or risks. So, if you are in a profitable trade that starts to turn and you now have less profit, your stop loss will not adjust downward. It will just stay set at the current price. Now, if the stock were to resume in the direction of the primary trend and set a new high, then your stop loss order will also increase. Volatility is the key to trading. This is true of any market or security. Trailing stop losses are a powerful tool, but it's not as simple as just flicking the switch on. 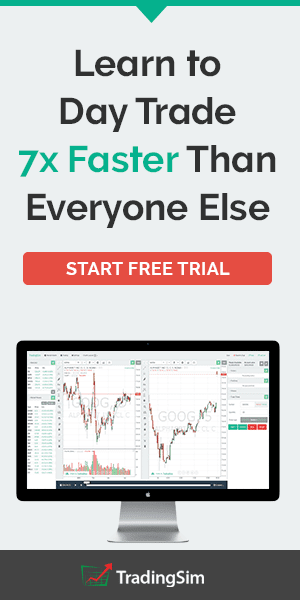 For example, let's say you are trading two stocks both valued at $10 dollars. You take a long position in both securities and place a 15 cent stop. The one stock proceeds higher in a nice orderly fashion and keeps you in the trade for over 2 hours for a nice profit. The other stock stops you out within 35 seconds of entering the trade. They both are 10 dollar stocks, but why did the one stock run your stop to only go higher shortly after taking you out of the market? You may think to trade higher priced stocks to avoid the shart price movements, but volatility is not defined by a stock's price. I can show you 4 dollar stocks that move as slow as IBM. When I say penny stocks, I'm talking about low float flyers. At one point I began to trail penny stocks I was trading that would have 20% or more moves in under 5 minutes. I was using the trailing stop as a means to ride the trend as long as possible. 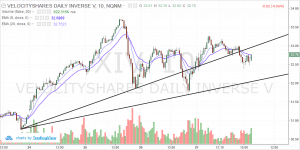 The problem with this approach is that the stock would trip my trailing stop and since the bid asks spreads were expanding due to the extreme volatility, I often ended up giving back more profit than I would have liked. 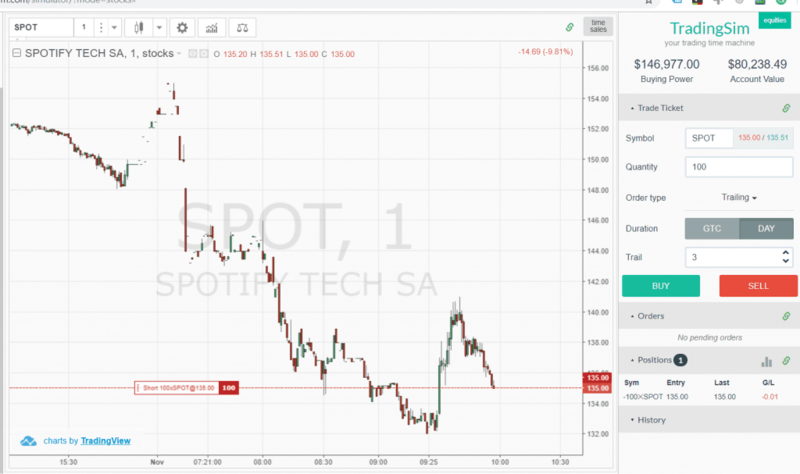 If you are using a broker that lacks trailing stop orders, you will need to enter the orders manually. This means that you can create a stop order. As the position moves in your favor you go in and update the order manually. You can update the order by reviewing swing lows or highs on the chart and then updating as the market goes in your favor. Another option is to use a moving average or other on-chart trend following indicators. There was a time where I would use a simple moving average on tick point and figure charts. As the moving average increased, I would manually increase the value of the stop. The downside to manual orders is you. You are your own worst enemy when it comes to trading. Once you get past the fears of placing a trade, the next giant leap you will need to take is properly managing your position and your emotions. To this point, stops are your first line of defense to ensure you will stay in the game long enough to turn a profit. Well, manual trailing stops will push you to your limits. You will need to constantly move the order in your favor. This sounds simple but think of all the things that can go wrong. What if you begin to question the strength of the move and close out based on a 'gut' feeling? What if you are trading a volatile issue and are using a moving average to follow the trade, but things move against you too quickly. First, my exit strategy for taking profit centers around selling into strength or predetermined targets. If I am stopped out of a trade it will be due to some key level being broken. This is because over time I have realized that the market cares very little about my arbitrary numbers tied to some profit target. You, of course, will need to determine which method works best for you, but there is no harm in getting in the habit of taking profits. You will never go broke taking money out of the market.